Spring is coming, and a new season means there’s plenty of chances to try out new things. Maybe you’re keen on a new attraction, a spring performance, or getting back to the park to see the spring blooms. For many in Los Angeles’ luxury homes, though, the spring is the perfect time to head to the kitchen and get started on sharpening their skills. The benefits of cooking at home are already well-known. You’ll have a better chance of eating healthier, living longer, and bringing your family together. If you’re thinking this spring is the perfect opportunity to give it a try, we’ve got your back with some fun recipes you can practice. Give these a go, and you’ll find the kitchen might just be your favorites spot in your home. This one comes to us courtesy of Bon Appétit. 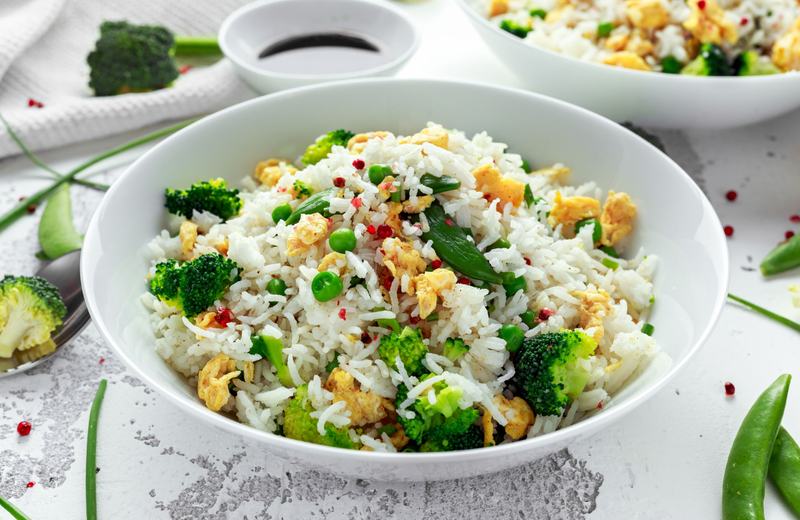 Their Fried Rice With Spring Vegetables And Fried Eggs promises a sumptuous stir-fry with a balanced combination of grains, vegetables, and protein. You can use any kind of rice or grain, but they recommend cooling your grains overnight, then preparing your meal the next day with all of your healthy ingredients. Those ingredients, by the way, include scallions, shallots, serrano chile, asparagus, ginger, peas, and, of course, your egg. After cutting up your vegetables, you’ll need to cook them up and fry up your egg on the side. Add your rice, continue cooking until softened, then top with your egg to finish. This recipe should serve four, and only net you about 580 calories a plate. Delish has a total of 12 hot spring recipes to try with tasty asparagus, but the one that caught our eye is Asparagus Quinoa With Fried Egg, for those days when you want to skip the meat. You’ll need your asparagus and quinoa, of course, and will have to supplement those with some bread crumbs, garlic, parsley, lemon, eggs, salt, pepper, and the secret ingredient -- hot sauce. After your prep work setting your cooking space, you’ll start by cooking up your quinoa in a medium sized pot. Once it’s almost done, add your salt and asparagus and turn down the heat while keeping it all warm. Mix together you additional ingredients, then fry them up lightly in a skillet. Add your eggs, then use your mixture to top the quinoa and asparagus. Small, delicious, and superbly snackable, these mini spring pizzas from Food Network are easy to make and even easier to enjoy. You’ll need some pizza dough, all-purpose flour, extra-virgin olive oil, scallions, kosher salt, sea salt, black pepper, ricotta cheese, lemon zest, fresh basil leaves, and grated parmesan cheese. You can even embellish this recipe with extra toppings if you so choose. Start by preheating your oven, then use your dough to make your pizza bases. Add the olive oil to your baking sheet, then bake those pizza doughs until they turn golden brown. Heat your scallions in the skillet, adding olive oil and salt for seasoning, then mix your remaining ingredients in a bowl. After brushing your pizzas with oil to protect them, top them off, season, and dig in when cooled. We can’t leave our meat-lovers out of the equation. Allrecipes recommends making corned beef and cabbage in the slow cooker to keep it from tasting dry and serving with a side of soda bread for a hearty meal that’s hard to top. You’ll need you beef, potatoes, carrots, onions, beer, cabbage, and spices to complete this one, and while the cook time is long, the process is rather simple. Throw your ingredients in the slow cooker, add your water and beer, sprinkle in your seasonings, then set your cooker to high. Next, you wait, for about 9 hours or so. Make sure you put your cabbage in at about the 8-hour mark. That’s it. You can use a liner in the slow cooker to make cleanup even easier and spend more time enjoying that delicious corned beef. Even if you hated peas growing up, TasteFood’s Spring Peas And Shoots With Pancetta And Orecchiette might make you take a second look at these awesome veggies. As the recipe so poignantly states, peas are part of “the essence of early spring,” and you’ll be able to enjoy them in short order with this easy-to-make dish. In addition to your peas, you’ll need orecchiette, olive oil, pancetta, garlic, chili flakes, cream, chicken stock, salt, pepper, mint, and some Romano cheese. Start by boiling your orecchiette until al dente, then saute your pancetta and set it to the side. Cook up your peas with your garlic and chili flakes, mix your pancetta back in, add your cream, stock, salt, and pepper, then boil. Combine everything together and stir thoroughly for your finished dish. You can serve immediately and have enough for four. We can’t forget about dessert, can we? Elizabeth Rider comes through with a No-Bake Raw Vegan Raspberry Cheesecake that is “gluten-free, dairy-free, soy-free, grain-free, low sugar, nutrient-filled, made from real food,” and, above all else, delicious. Since there’s no baking involved, this recipe is pretty simple, and you’ll just need do a bit of additional work after you gather your ingredients: raw almonds, dates, vanilla extract, sea salt, coconut oil, coconut cream, raspberries, and lemon juice. After throwing the ingredients for your crust in the food processor and pressing them together in a tart pan, you’ll need to freeze them solid. Then, you’ll mix together your filling, top the crust, and let it all freeze for a few hours to harden. Once it’s out, you can enjoy at your leisure, remembering not to let it melt and placing it back in the freezer to keep it together. Great places to live, like Eighth & Grand, have amazing kitchens just waiting for you to put them through their paces. Why not put your cooking skills to the test in a place that’s practically begging for you to whip up some fine spring meals? Check it out, and put this community on your short list for superior Los Angeles living.